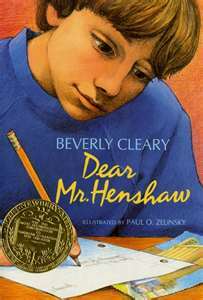 Dear Mr. Henshaw is Beverly Cleary’s highest award-winner, capturing the Newbery and Christopher Awards in the early 80’s, yet it is one of my least favorites. Written as a series of letters and journal entries, with absolutely no narration, Mrs. Cleary somehow, miraculously, weaves together a plot, a central-California setting and a well-rounded character. This accomplishment is a testament to her craft; the story is emotional and compelling. I simply don’t care for the style. In a departure from her usual optimistic, fun-and-quirky subjects, Mrs. Cleary introduces us to Leigh Botts, a troubled boy who wants to become a writer. Through a series of letters sent to his favorite author, Mr. Henshaw, we catch insights into Leigh’s likes and dislikes, his hopes and insecurities, his absent, immature, truck-driver father, his wonderfully strong and supportive mother, and his loneliness. He quickly catches our hearts and our sympathies. As Leigh’s first letters are rather insulting and demanding (humorous peeks into a child’s mind), Mr. Henshaw encourages him to keep a journal instead. We watch Leigh’s writing abilities grow stronger and stronger. Though Leigh’s never receives the happy turn of fortune he longs for, he learns, he grows, he meets with some success, and he grows stronger. For a child, this is a story of the triumph of the human spirit. For a parent, it is a wake-up call to consider exactly what adult selfishness and irresponsibility can do to the children who depend on us. One not to be taken lightly. Though I much prefer traditional narration, the skill, the message, the powerful emotion of Dear Mr. Henshaw prompts me to recommend it. Click here for a Kindle edition. Read more of my Beverly Cleary reviews.